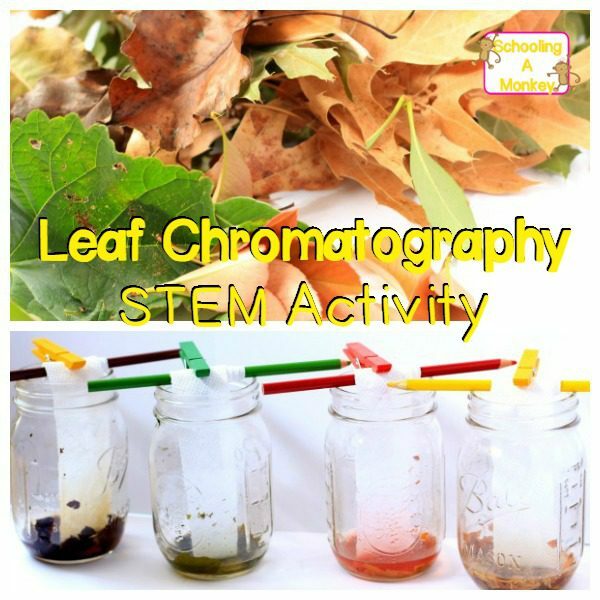 Leaf Chromatography STEM Activity: Remove Color from Leaves! 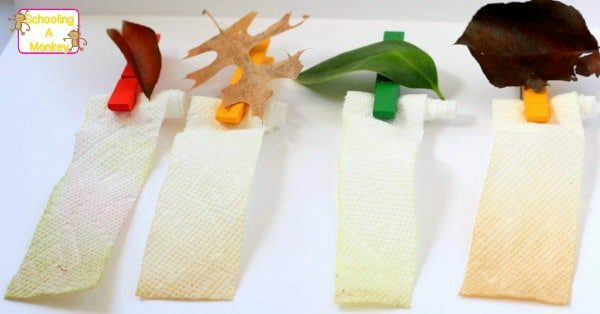 This leaf chromatography STEM activity shows just how many hidden colors there are in fall leaves! Your kids will have a blast discovering just how brilliant leaves really are. My kids are big science lovers and we do as many STEM activities as we can fit into our schedule. This year, we wanted to do something with leaves and uncovered the classic science project of chromatography. Chromatography is the process of using a solvent to pull color from something. During the process, the colors separate into distinct sections, similar to how printers use three different colors of ink to make every color imaginable. 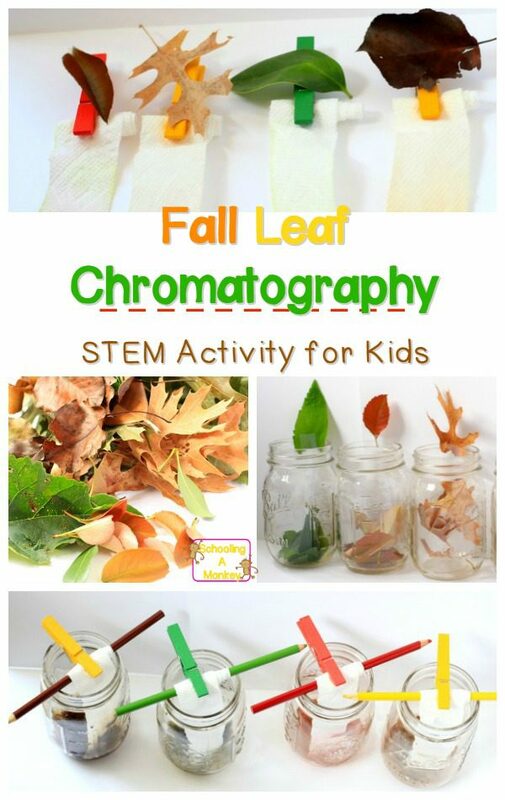 Conduct your own leaf chromatography experiment using the tutorial below. Find the full list of Fall STEM activities here! Leaf Chromatography: Remove Color from Leaves! You won’t believe how exciting it is to simply see what colors are inside of fall leaves. My kids were completely delighted by this experiment and are asking to do it again soon! The experiment just takes a few materials and is very budget-friendly. The leaf chromatography experiment sounds a little confusing at first, but it is actually quite easy. We looked at several tutorials and combined the elements into the following step-by-step directions. The following process produced the best results. Cut your leaves into small pieces. Keep each leaf divided by color. We had a dark brown, yellow, red, and green container for our four mason jars. Crush the leaves even further with a mortal and pestle, fork, or spoon. 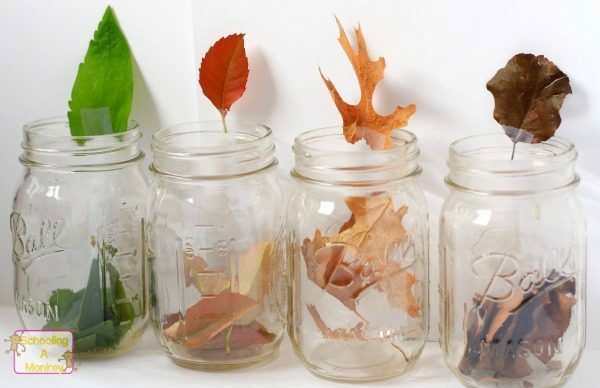 Place each type of crushed leaf into a mason jar. Pour rubbing alcohol over the leaves until they are just covered. This will take about a tablespoon, depending on the size of your jar. Note: If you don’t have rubbing alcohol, you can also use nail polish remover or vinegar to release the colors, but the results will not be as drastic. Place your mason jars into a large pot filled about 2 inches with water. Heat the pot until the water starts to boil (the alcohol should not boil, but get a little warmer). Heating the alcohol will help the colors release into the alcohol faster. Set the jars in a dark area overnight. Remove your jars from your dark area. Cut the chromatography paper into strips just long enough to barely touch the alcohol when suspended in the middle of the jar by a clothespin suspended from a pencil. Look at the picture for how this works. Let the paper strip absorb the alcohol. It could take a couple of hours. Once the alcohol reaches the top of the strip, remove them from the jars and set them out to dry. At this point, I was worried that the experiment had failed, because I didn’t see much color. But, as the paper dried, the colors were revealed. So, if your paper is faded, just be patient. The colors will show up. Once the strips are dry, examine the various colors that were inside each leaf. Even though they look one solid color, most leaves have several colors. If you have particularly brilliant leaves, you may even see some blue in there! Our biggest surprise came from our red leaf. It looked solid red, but when we separated the colors, there was quite a bit of green in it! We’re going to repeat this experiment again during Texas’s true fall, which is usually in early December. We get all kinds of neat colored leaves then, including bright purple. I can’t wait to see how that one turns out! Continue your study of leaves with these ideas!